You might think that drama practice is all about working lines, practicing blocking of scenes, digging in deep into the themes of the piece, and pushing the script further than you had it a week ago. Well, that’s not really true. Here’s what really goes on. Yes. 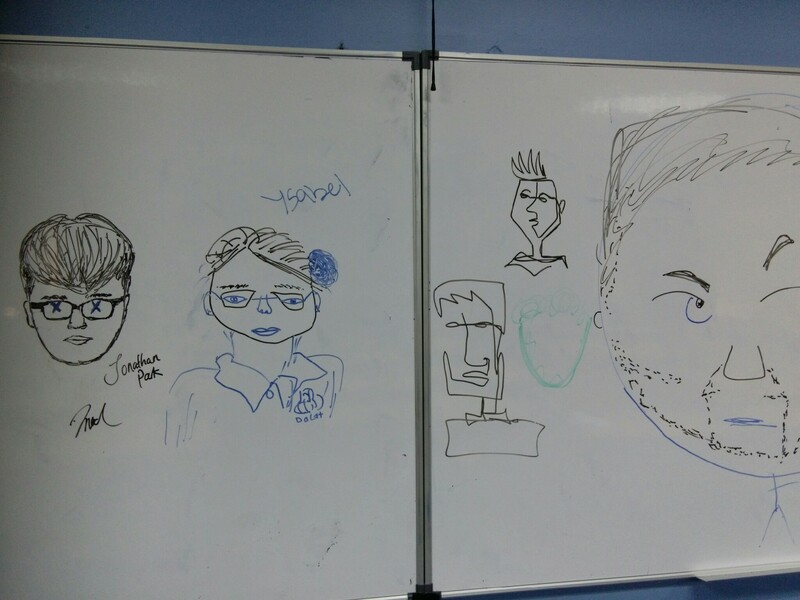 Drawing caricatures of the director and actors on the white board. That’s me on the right. I have a really round face but a square head. I was not aware of that. That one in the middle is supposed to be me too, even though I don’t wear glasses or I don’t wear a bow tie. What are these actors smoking? That’s JP on the left. He’s from Korea and he’s playing the captain of the guard when not posing for whiteboard caricatures. The lady beside him is Yzzy, probably the instigator of all of these drama shenanigans. She’s heading to university next year as a theatre major. Perhaps she should switch to art. This is the craziness behind the scenes which bring about (eventually) theatre excellence. 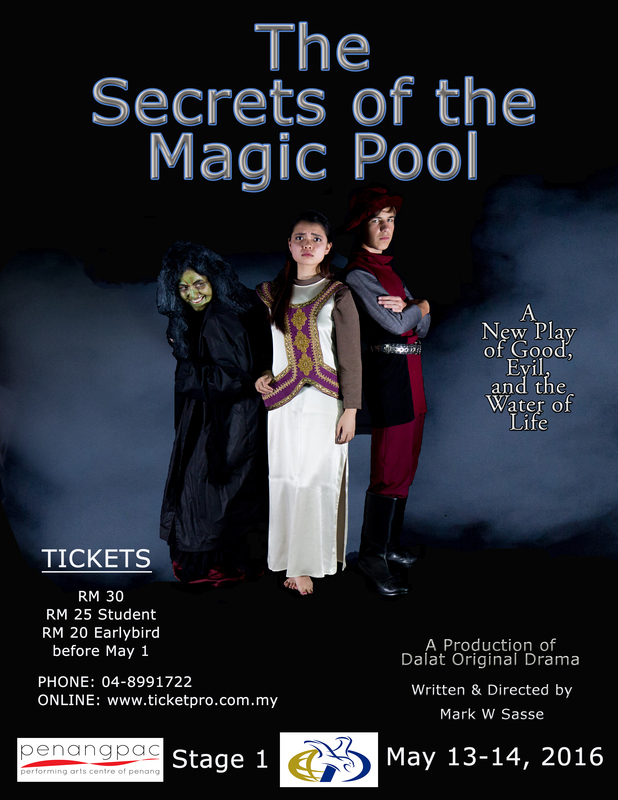 Two months more until the world premiere of “The Secrets of the Magic Pool.” Can’t wait! 8:30 Arrive. Set-up and arrange microphones, drama cubes, and props into their proper place. 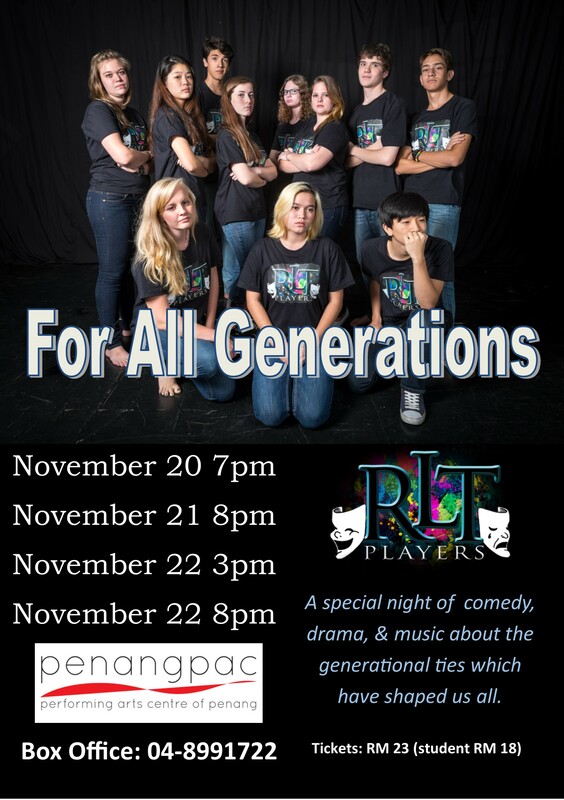 9:00 The director (me) throws a curve at all the actors and redoes the last piece without warning. We relearn movement, pacing, and timing to match perfectly with the choreographed dancing and music. After about the 4th run-through, they get it. It’s much improved. 9:45 Two actors want to re-write the between sketch transitions. I fully allow them to do this as I go over new sound cues with the tech team. 10:30 The fun begins – the first run-through. A few hiccups and an hour and forty minutes later, we emerge from darkness with a few bumps to iron out, but one step closer to opening night. 12:30 Lunch. I walk across the street for a thick bowl of butter chicken masala and a garlic, butter nan. And can’t forget the delicious teh ais. 1:30 Debrief. Run through “God’s One Question” one more time to nail timing and movement. Ready. 2:00 Final run-through. We have a tighter performance and shave a few minutes off the running time. That’s always a good thing. 4:00 Debrief and talk through the hectic week ahead of us. 5:00 Go home and collapse. Three months of rehearsals are finished. We are ready to release our new show to the world. As usual, I’m excited and nervous. What will the audience think? They rarely think what I expect. Either way, we gave it our all. Let the games begin. 2. Acting is about being real. Committing yourself to a role by personalizing it, understanding what part of you is already in this character. 3. Acting is about being a person – a real person – 100% of the time. A mother in the kitchen cooking breakfast for her family doesn’t wear a costume. She wears an apron. A mechanic working under the hood of sports car doesn’t wear a costume; he wears overalls or a uniform. The point is, every (human) character is a real person and needs to be treated as one. 4. Good acting transcends acting. Good acting is, in fact, not acting at all. It expresses human experience in authentic ways. It makes no difference if an audience is watching a performance or not. The actor represents a real human being in a real life situation. It is no place for costume jewelry. Is it any wonder why acting is so difficult?